The forecasts during the week consistently showed Northerly winds for the weekend so we were looking forward to another downwind trip across the Channel, we weren't expecting it to be quite so windy. Getting out of the Medina river from our mooring upriver was a bit of a bumpy ride, I've never seen such waves from the chain ferry to the river entrance caused by the near spring ebb against a strong Northerly wind. Fortunately the sea state quietened down once in the Solent. We did a few passes through the line with the full main and decided with the little extra push from a #3 genoa that this was the sail plan for the beam reach to the Forts. We made a clean on time start, perhaps not at full speed but good enough to lead the class 5 fleet off the line. Mack the Knife soon overtook to leeward looking very powerful and climbing higher than us to round Snowden ahead. We struggled a bit with our sail plan, having to dump a bit of main in the gusts until we bore away for the easier reach to No Mans land fort and then held the wind and settled down. Mack the Knife continued to ease away, Xara stayed close behind slightly to weather, we eased away from Rainbow and Aquila dropped back fairly quickly looking to be very conservative with their sail plan. We decided to leave any sail changing until after Bembridge and the gybe to put us on course for Cherbourg. The deeper run to Bembridge enabled us to start holding Mack the Knife and the rest stayed as for the reach to the forts. The waves, immediately after Bembridge, were quite big and the surfing began. We thought the chicken chute might be the downwind sail to go with but decided to wait until we had a 10 minute period of apparent wind below 15 knots before hoisting. Just passing Culver Cliff this happened, however, having taken the decision to hoist and before any real activity had taken place the apparent wind was back to over 20 knots. We decided to be a bit more cautious. We were sailing around 210 magnetic but the #3 genoa was barely functioning behind the mainsail. #1 genoa became the preferred sail which went up and poled out to give us a superb stable running platform for the ride to Cherbourg. Long surfs were now commonplace. Two huge waves gave us a 16 knot and a 15 knot surf, perhaps we were actually planing. It would have been nice to see the spray coming off the boat in those conditions but the bright Moon, although giving plenty of light, was not enough, we just had the thrill of the express train noises of the wind and water and of course hope that the rig stayed in the boat. I'm told that looking back at the size of the waves approaching was not a good idea, so I didn't! With this sail plan we were starting to leave Mack the Knife and Xara behind, they were going much higher than us along the back of the Island. Apart from the two really high speed surfs 14 knots was occasionally reached and 10s commonplace. Keeping the boat on track was fairly easy with the poled out #1, three times we rounded up into the wind but there were no dramas and the boat returned to the proper course once the load came off the tiller and virtually no flogging of sails. The east going shipping produced a bit of a scare, one ship on a collision course turned to port to clear our stern so we all relaxed. Next time we looked she had turned back onto the original course. As we watched with foreboding she eventually turned again to miss our stern. Perhaps the rapid changes in our speed threw them as we surfed down the waves and then slowed waiting for the next one. As we approached Cherbourg we found we couldn't sail low enough to make the finish so at ten miles off we shipped the pole and gybed onto port for the finish. We goose winged the #1 again but without the pole this time, it still worked but there were a few loud whiplash noises when the sail refilled after collapsing momentarily. We were amazed to hear Peter C on the radio at the finish, we guessed in a car on the road that runs out passed the harbour wall, thanks to Peter and Sandy, very much appreciated devotion to duty. 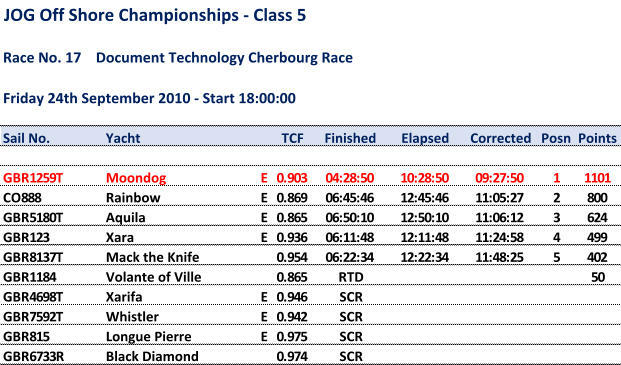 We finished at 04:29, a great trip to Cherbourg, almost certainly our fastest ever in a 28 foot boat. And a very dry passage to boot even though we experienced over 30 knots of true wind at times. What a way to get to Cherbourg, tie up at 5am whilst still dark, a swift beer to celebrate the sail and then to the pit for some well earned sleep followed by a near full day in Cherbourg. It was then great to find we had won our class and even more pleasing to be ahead of classes 3 and 4 on corrected time as well, great boats are Laser 28s, downwind anyway. A wonderful way to finish off a great year of JOG racing. Our heartfelt thanks to all the race officers and helpers who start us off and especially those who get up at the most unfriendly hours to record us over the finish lines and organise the receptions around the Channel ports.